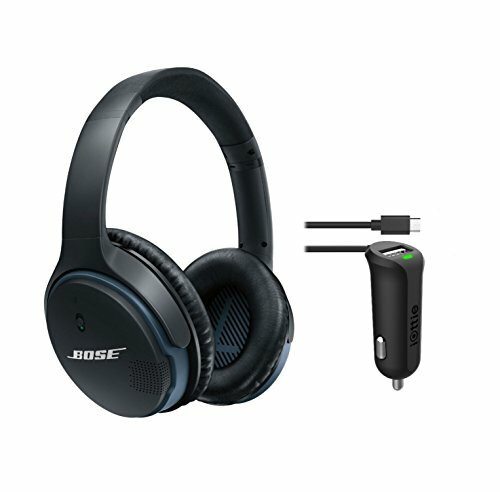 Bose SoundLink Around-Ear Bluetooth Headphones, Black, with iOttie RapidVolt Mini - Micro USB Car Charger by Bose at All Company Mobiles. MPN: 741158-0010_CHCRIO102. Hurry! Limited time offer. Offer valid only while supplies last. Bose SoundLink Around-Ear Bluetooth HeadphonesThe most important component in a better wireless headphone experience is driven by what you hear. The most important component in a better wireless headphone experience is driven by what you hear. Class leading SoundLink® around-ear wireless headphones offer amazing audio quality. The wireless Bluetooth® headphones offer a combination of exclusive technologies in TriPort® and Active EQ delivering sound that's crisp and powerful at any volume. So you can be truly moved by your music as you move with it, untethered. The latest Bluetooth technology lets you easily connect to your mobile devices with seamless audio/video sync. And you can stay connected to-and switch between-two devices at a time. When you're watching a video on your iPad® or tablet and a call comes in on your iPhone® or smartphone. Choosing to answer the incoming call, pauses the video and connects the headphones automatically to your caller. At the end of your conversation, the headphones automatically resume the video and switch back to it, so you don't miss a thing. The headphones are engineered for your busy life with impact-resistant materials, glass-filled nylon and corrosion-resistant stainless steel. With soft ear cushions and a contoured headband, they're lighter and more comfortable than other comparable wireless headphones, so you can enjoy them all day long. When you're done listening, you can fold them flat for storage in their compact matching case.